Wow, a new bread machine! Hope to see more breads from you! With this new toy, I feel like making bread every now and then, haha. U are right. The B.M make the bread making become so easy for me. Don't need to exercise my arms alr. 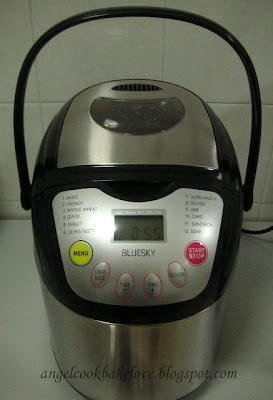 Is this bread machine good?? Not expensive and feel like getting 1 for myself too. I never use expensive one b4 so I can't compare. So far so good, I got no complain about it but I am not sure if you can find in Malaysia. Sorry for bothering, may I know what oven you use too? My oven just spoil and I'm very desperate to buy a new one to bake for CNY but I don't know which brand to buy.. I think there are many good brands to choose from depending on your budget. I am using Tecno brand 41L. I bought it because it was on sales that time, no preference actually but so far so good. Hi! 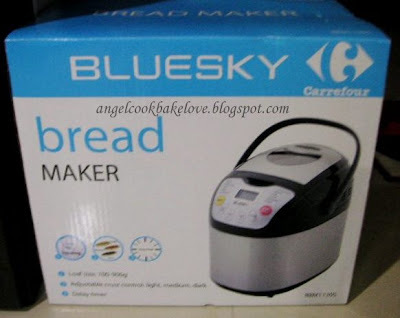 It's me again try to find this bread machine in carrefour but can't find one perhaps it's discontinue. Hope can get one as my family is a bread lover. Are you referring to Carefour Singapore? I went to Carefour in JB, never see this also. I bought it from Suntec branch. U may call the customer service line to check for the stock, this is what I did last time. Just called the customer service line at Suntec branch they no longer carry the bread maker anymore so sad. Since you own a KitchenAid mixer, I think it can do the job pretty well. So it is actually not neccesary to buy a bread machine. 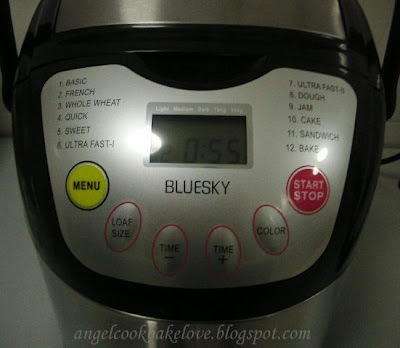 However, if u have higher budget, u may consider buying a more branded one such as Kenwood. I saw it selling in Courts. If I am not wrong it is sold at SGD200+. Definitely better quality.